On the 19th July 1545, the Mary Rose - second largest ship of Henry VIII's fleet - set sail from Spithead to challenge the French invaders. In full view of the King and his assembled forces, the great ship capsized taking with her almost 700 men. More than four centuries later, in 1982, her hull was successfully raised from the seabed. The Mary Rose now rests, restored, only a short distance from Lord Nelson's flagship HMS Victory in Portsmouth's naval dockyard. The Relic of Mary Rose is a delightful book, devoted to the story of the sinking of the Tudor ship. It contains an eye-witness account of the tragedy by Sir Peter Carew, a near relation of the Mary Rose's ill-fated captain. 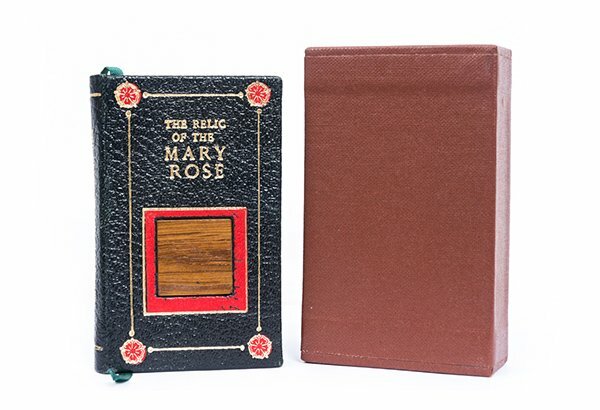 This exquisite miniature volume is now available again: as a strictly limited edition, each numbered, and signed by Margaret Rule, Archeological Director of the Mary Rose Trust. Full leather with gilt decoration and an inlay of beautifully polished and lacquered fine English Oak from the Mary Rose. A facsimile of the 1842 edition, THE RELIC OF THE MARY ROSE is a delightful book, devoted to the story of the sinking of the Tudor ship. It contains an eye-witness account of the tragedy by Sir Peter Carew, a near relation of the Mary Rose's ill-fated captain.